Social media is a new rage in SEO industry. Yes it is no longer a secret. All SEO professionals know the fact that social networking plays an important role in search engine rankings. I get this question asked quiet a few times. Does social presence helps our SEO efforts? Why are search engines using social signals as one of metrics? The answer to that is simple. When your friends on twitter, facebook or Google plus find somethings awesome and share worthy, they share them. It is most likely that you will also out of curiosity check that link out and if you find it interesting you might also share it. This cycle goes on and on and on. You must have seen some of links getting thousands of shares, tweets or plus ones because people find them interesting. If a website, blog, news or any other educating link is shared in social networks it creates trust & authority in eyes of search engines. Now that it is clear that social networking sites does help in SEO rankings therefore you must create accounts in these websites and start sharing your or your clients links , blog posts, news or anything you find interesting. The rise of social media had created new opportunities for individuals and business owners to connect and interact with there audience/potential clients in an effective and affordable manner so having an active web presence in these networking sites is very important for individuals, businesses, brands and companies in order to effectively engage networking websites then I would recommend these five ‘must have’ social accounts in order to enhance your SEO efforts. Google plus is the top priority. This social networking site is operated by Google it self. Having an active account on Google plus is great for ranking newly blog posts. Some of blog posts published on G+ get indexed quickly within days. All SEO professionals use G+ in order to enhance there own and their clients websites. I do the same and this gives quiet surprising results. I had experienced my posts ranked instantly. It is a great tool for getting your posts indexed quickly. Creating an account on Google plus will not only help your rankings but it will also created trust and authority in eyes of Google for your brand, business or website. If you wish to create a Google plus account click here. Twitter is another awesome social networking site and a must have tool for business. It is a micro blogging platform. It is easy to use and you can follow and get followed by thousands of people. It is also the best way of spreading your content because of it’s ease of re-tweeting or tweeting your favorite content. It also sends signals to search engines of the popularity of links. Try to get as many followers as you can. The more you connect the more chances of your tweets or links getting shared. If you wish to create a twitter account click here. You must have seen some of pics, videos, news or other interesting content shared thousand of times. Think how about your website getting thousands of shares by facebook users? sounds good? . Yes facebook is a great tool to spread your word around. Some of websites which were previously unknown got thousands of fans in very limited time. Only because people found out about there great products or services via there friends and followers. So one viral post can take your business to next level. If you want to create face book account visit facebook website. You tube is a video sharing platform and it is one of my favorites. Videos are amazing. Not only do videos engage your viewers in and effective manner they are also a great way to explaining your whole products, services or message across in few minutes. You tube gets nearly 2 billion views a day. By having your videos in you tube you can educate your audience/customers in an engaging and entertaining way. You can also embed your videos in your blogs. Its a great source of traffic and links for SEO purposes. Some companies are also offering Video SEO so that your video ranks on top when some one search for specific key words. You can use your Google account in order to sign into youtube. Linked in is a social networking website for professionals, however when you create an account in Linkedin you create get a one way back-link from highly trusted website because link building is back bone of any SEO campaign. Getting this link is great for your SEO efforts. Create linkedin account here. Creating and managing accounts on these websites is a time consuming task but it is worth putting efforts and time into these activities. Not only will these sites create an opportunity for you to connect with your potential clients but it is also a great for your SEO campaign. You might have found me either by search engines or by clicking one of links on social networks. At the end of day my goal was to bring you onto my website engage you. if you are reading this article, I have been successful in it. 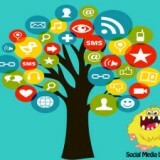 similarly you can also attract your audience to your website by having an active social presence.